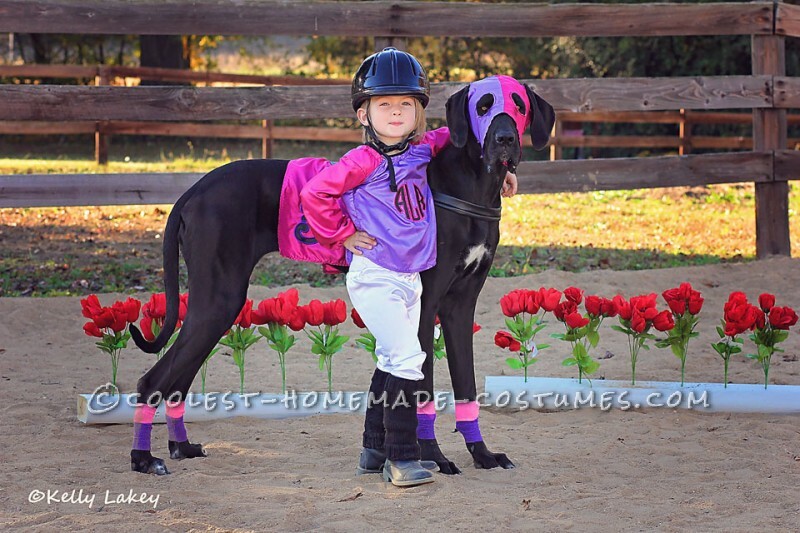 Cutest Race Horse and Jockey Duo Costume Ever! We own danes and horses and everyone teases us we keep small horses in our house. 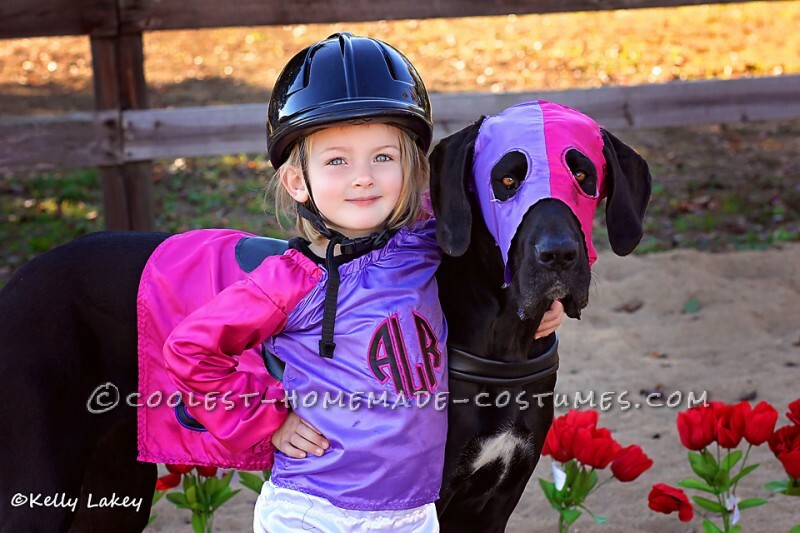 So it was only natural we created a race horse/jockey duo for Halloween! I bought silk blends and some faux leather at Joannes Fabric Store and got creative to come up with a pattern! I started with a dish rag for my saddle pad pattern and then hemmed my edges. 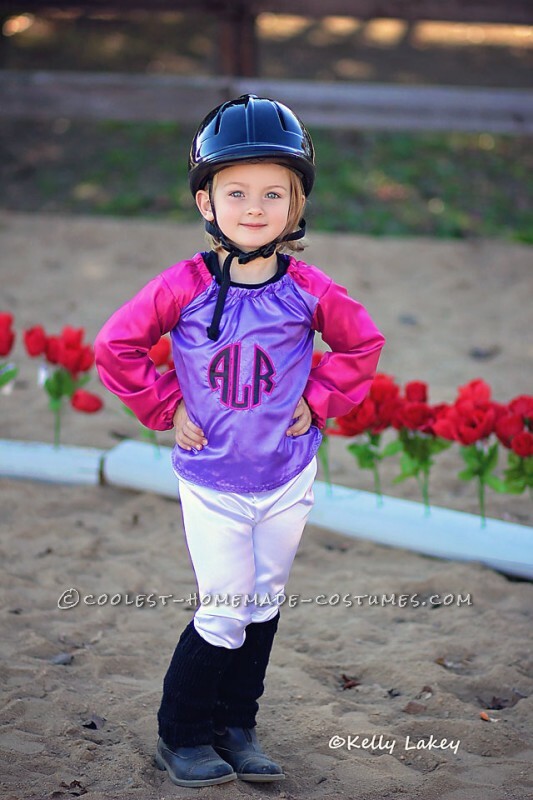 I embroidered the number which happened to coordinate with the jockey’s age. I measured the dog to design to strips, one for the girth and the other for a breastplate, to hold the pad in place and used velcro strips to fasten. I hand drew a saddle pattern and cut out of the faux leather and then top stitched on my pad. The blinkers were the most difficult part. I used a sheet of paper layed across the dogs head to mark where the ears would need a hole as well as her eyes. Then I hand drew a pattern that roughly resembled a trapezoid and marked where my holes needed to be. This “trapezoid” would make up half the face and would cut out two identical pieces and sew the long sides together. I embroidered a circle where the eyes would be and then cut out the center of the circle. I used a button hole technique to make the slit for the dogs ears. 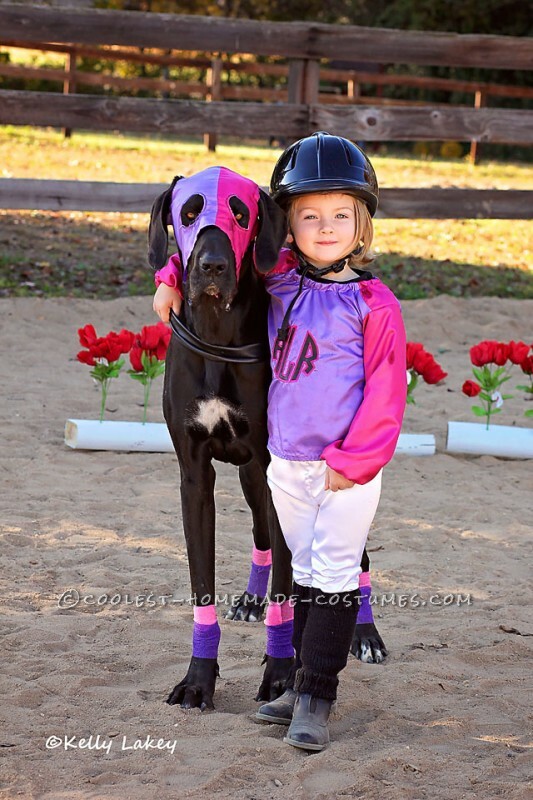 The short sides would fasten with velcro under the dog’s chin. 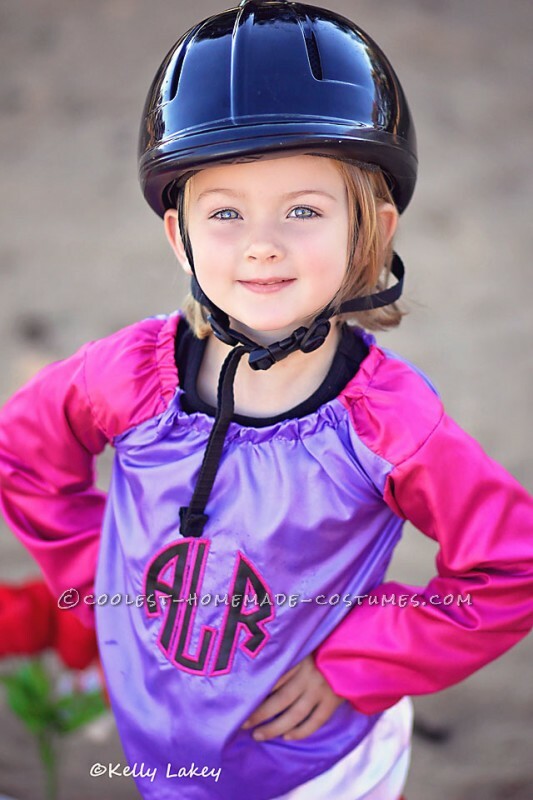 I just used a regular blouse pattern and chose to use different colors of fabric to represent the typical style jockey blouse and chose to again embroider the jockey’s initials on the center of the blouse where most jockey’s would have a special emblem. Same for the pants. Just used shiny silk blend and used legging pattern. Since we our horse people she already had the paddock boots. I had my mother knit her some black leg warmers to give the look of tall boots and we already had the helmet. 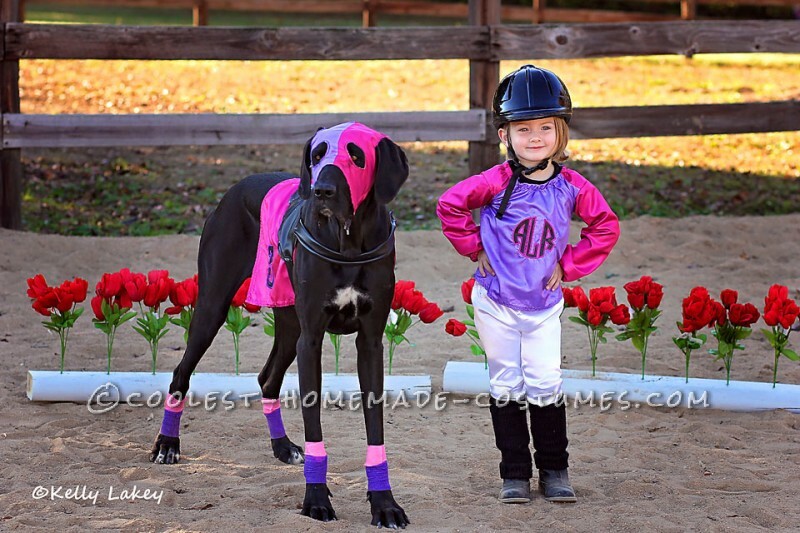 And the easiest part and the finishing touch was the matching colored vet wrap we used to make the “horse’s” leg wraps. It was a lot of work and frustrating to say the least as I have only been sewing about a year and mostly making pillows and simple stuff! I think next time I will go for something with a pattern but it was all worth it in the end b/c it turned out super cute!! !